Akello Concy 31 years, married with 4 children, I joined the WGEF Loan program in 2010 when I was starting my new life from IDP Camp to resettle in my Village. We hardly had no where to start from, no shelter, no food, and no income at all. Only what I had was hope and resilient. I joined WGEF in 2010 and was given training and an agro loan of $ 90 to open my land, I started with vegetables growing on a small scale, Now I grow 5 hectares of vegetables and sweet potato’s which I sell ant my stall in the market fresh from my garden. To support the many women, like Concy, who participate in WGEF programs, please consider a contribution on Colorado Gives Day. 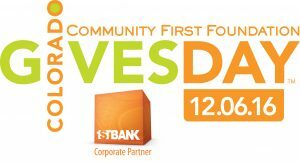 You can schedule your gift now for Colorado’s annual day of giving on Dec. 6, 2016.